OTTAWA, ONTARIO--(Marketwire - Aug. 6, 2009) - Health Canada is advising Canadians that the company Medtronic has initiated a recall of its Paradigm Quick-set infusion sets with lot numbers beginning with "8" ("Lot 8"). A small percentage of the affected infusion sets may work improperly and may deliver too much or too little insulin, which could cause serious health effects. Patients can contact Medtronic of Canada directly to arrange the return of any "Lot 8" infusion sets and receive a replacement product. 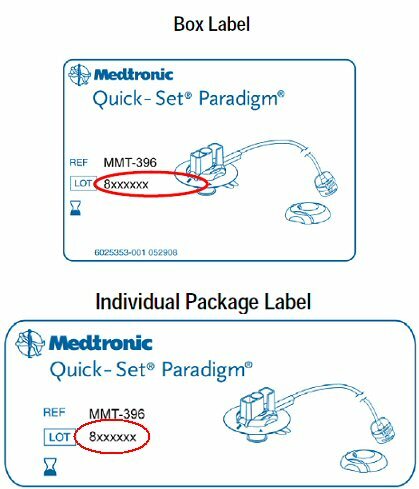 Information about the recall is available on the Medtronic website (http://www.minimed.ca/home.aspx?pagename=UrgentRecallLot8〈uage=English), or by telephone between 8:30 a.m. and 7:00 p.m. (Eastern time) at 1-800-284-4416. Patients with any questions or concerns regarding a medical device they are using should contact their pharmacist or health care professional. The recalled "Lot 8" Quick-set infusion sets were manufactured by Medtronic primarily for distribution in the United States. Limited quantities of these sets were also distributed in Canada by various distributors. Health Canada is monitoring the recall and has also issued a Notice to Hospitals (http://www.hc-sc.gc.ca/dhp-mps/medeff/advisories-avis/prof/_2009/infusion-perfusion_set-disp_nth-aah-eng.php) informing health care professionals of the recall. The lot number is clearly marked on both the box label and on each individual infusion set package (http://media3.marketwire.com/docs/Quick-set1.jpg). This product recall affects only "Lot 8" Quick-set infusion sets with the following reference numbers: MMT-396, MMT-397, MMT-398 and MMT-399.